Hello! 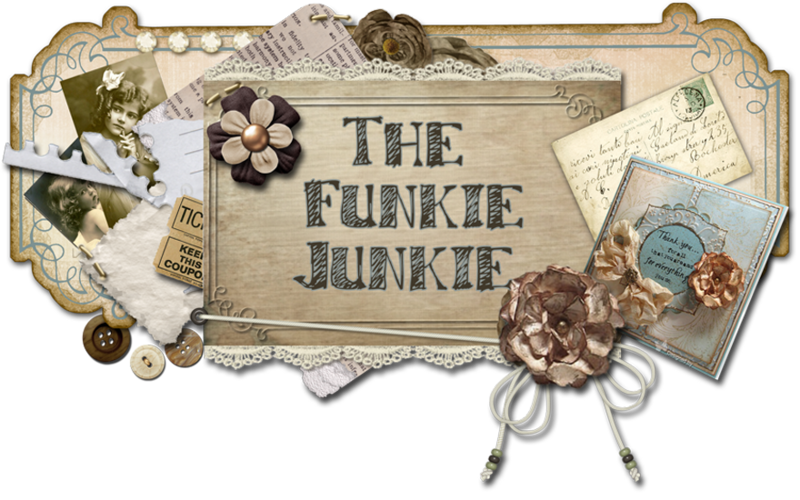 Welcome back to the 12 Tags of Christmas Funkie Junkie Style! I hope you all had a terrific (and crafty) weekend. I'm back for week #6. Yes, that's right folks, we are half way through the 12 tags of 2013! But don't worry. You have another six weeks to finish all 12 tags - all 12 links are open through December 22nd and you can complete the tags in any order. All the "rules" are found in Week #1 post. Here's my tag #6. I had promised more traditional Christmas colors this week so I decided to go back to the Maja Design It's Christmas Time patterned paper. I love the muted vintage country style of this collection. I started with a one of the jumbo non-branded manila tags sold in the boutique and stamped the text stamp from Stuff to Say in Jet Black archival. Next, two pieces of the designer paper were cut to layer over the tag. I distressed the edges with my fingernail, ripping them a bit, and then sponged the edges with Vintage Photo DI. A rectangle was cut from what CS with one of the Sized Rectangle M&S dies and then cut again across the top with the Torn Notebook On-the-Edge die. 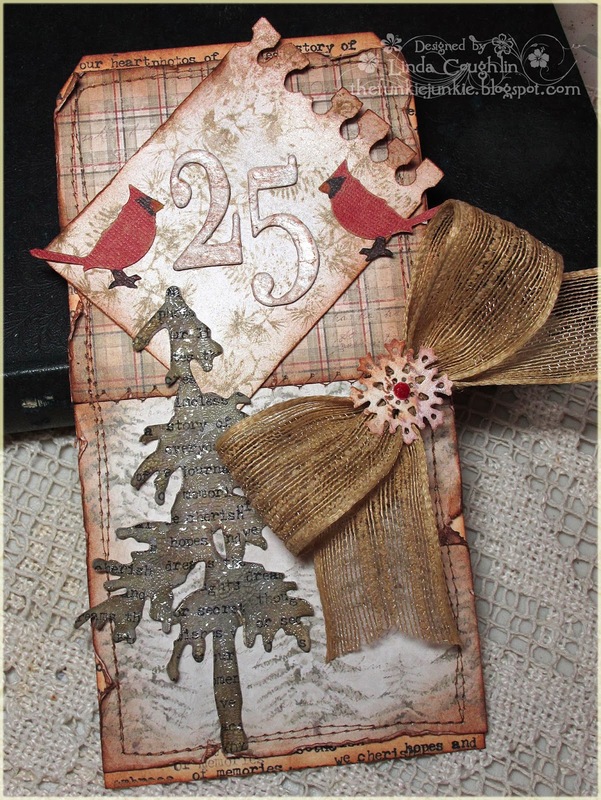 It was sponged with Vintage Photo DI and then stamped in Frayed Burlap DI with the pine needles/pine cone stamp from Mini Holidays 3. I decided I wanted a little bling so I misted it with Perfect Pearls Heirloom Goldl mist. The '25' was cut from plain gray chipboard and then painted white with Picket Fence distress paint. When dry, it was edged with Vintage Photo DI and stamped with the ledger stamp from a Wendy Vecchi set. Then it was also misted with the same Perfect Pearls mist in the Perfect Pearls color. The cute little cardinals were cut with the Mini Poinsettia and Cardinal die from kraft core paper, sanded and accented with colors using Copic markers. The pine tree was also stamped with the text stamp from Stuff to Say, sponged with Iced Spruce and then sponged a bit more with Frayed Burlap, then painted with Clear Rock Candy crackle paint. The bow is natural woven jute ribbon which is sold in the boutique. Thank you so much to everyone who has played along. And if you haven't, I hope to see you joining in before the end of the challenge! 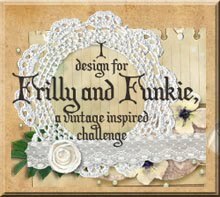 The supplies below, used to make this tag, are available at The Funkie Junkie Boutique, where Tim Holtz/Ranger products are always 20% below MSRP. Natural Woven Jute Ribbon - 1.25"
Oh Wow Linda! I love this one! Ah, I always forget that your comments box is below the "ingredients". Haven't commented on any of your tags yet, but have enjoyed them all! (and loved playing.... just about finished no 5). Glad you didn't go for the bright reds and greens, but those touches of colour are gorgeous! Beautiful tag. Love that plaid paper, the stitching, the color...well love it all!!! That is so beautiful, I love all the different textures. 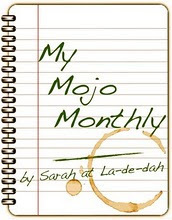 I've got week 4 & 5's cards made, just got to blog them & then think about this one. Gorgeous tag Linda...love those ripped edges & the stitched layers! OH MY WORD....I love this one so much!!!!!!! 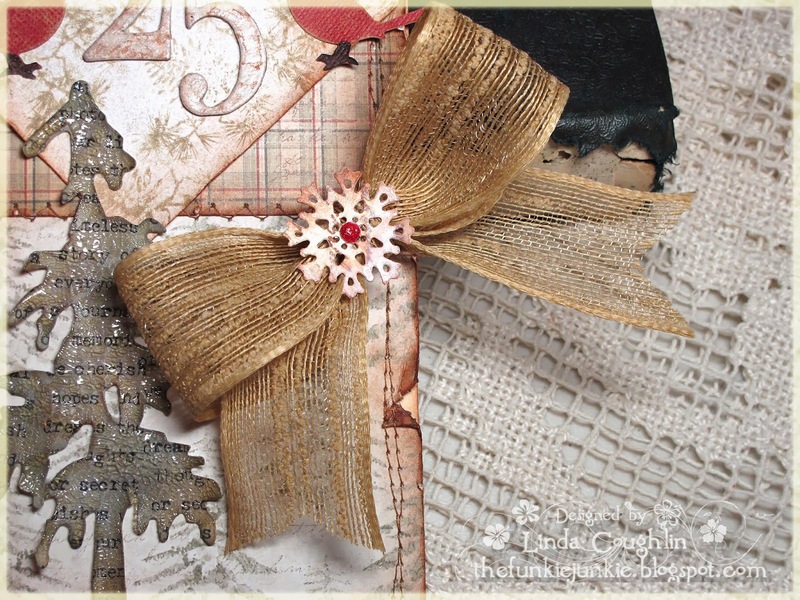 Loved playing with this one - and thank you for making me actually USE some of my Maja papers!